Trigeminal neuralgia is a type of severe nerve pain which can be a symptom of MS. Professor Joanna Zakrzewska, a specialist in facial pain at the Eastman Dental Hospital in London, explains what causes it and how it can be treated. Trigeminal neuralgia is a severe nerve pain which can give stabbing or burning sensations down one side of the face. The pain comes on rapidly and, at least initially, lasts for seconds or a few minutes. Anything between 5 and 50 episodes can occur in a day. In between there is often no pain. The pain is sharp and most commonly described as an electric shock or lightening. It is particularly provoked by light touch activities such as eating, brushing the teeth, washing the face, and going out in the cold wind. An attack can last for weeks or months and then disappear completely. These remission periods can vary from weeks to months or even years but at present there is no predicting as to when it will go into remission. This symptom is called trigeminal neuralgia because it is the trigeminal nerve (also called the fifth cranial nerve) which is affected. Neuralgia means pain that follows the path of a nerve. 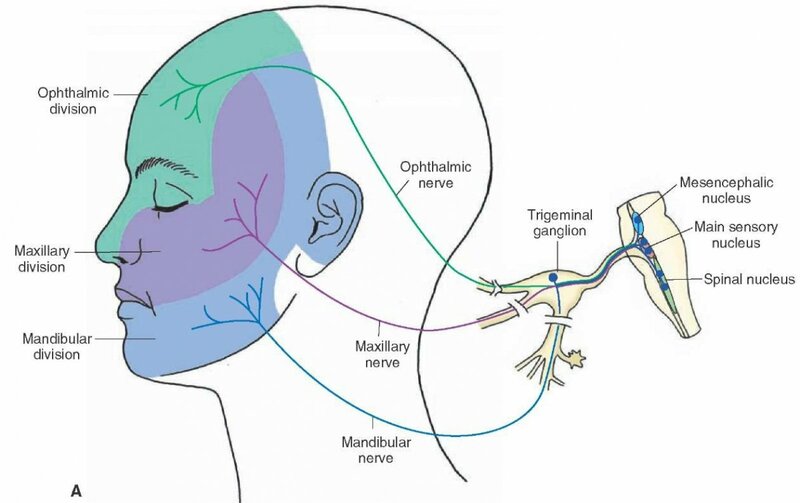 The trigeminal nerve has three branches. The top branch (the ophthalmic nerve) affects the eye, forehead and nose. The middle branch (maxillary nerve) affects teeth and gums in the upper jaw as well as the upper lip, cheek, lower eyelid and side of the nose. The lower branch (mandibular nerve) affects the lower teeth, gums and lip. Research has shown that people who have multiple sclerosis are more likely to experience trigeminal neuralgia, affecting about four and six in every 100 people with MS. When it happens in MS, the disorder seems less likely to go into remission and is often more difficult to manage. As yet no research has been done to determine if it coincides with relapses in MS or any particular form of MS.
Trigeminal neuralgia has a huge impact on quality of life. It can result in loneliness and isolation as so many social events include eating, a task that becomes impossible during attacks. There is always a fear that it will strike unpredictably. Low mood and depression are common during attacks. The cause of the disorder is still not fully understood but we do know that there is 'cross talk' between nerve fibres that carry sensations such as touch and vibration to the brain and those that carry sharp pain. In MS this cross talk is caused by loss of myelin on the trigeminal nerve. The damaged nerves react to touch sensations and send incorrect pain signals to the brain. The mixing up of signals can also be caused by compression of the nerve by a large blood vessel inside the skull before the nerve reaches the brain. Current research is looking at potential genetic link, whether myelin formation is abnormal or whether stem cells could be used to regenerate the cells. As the face looks 'normal' and there is no physical aspect to the symptom, there is a lack of understanding of the severity of this disease - not only among the lay public but also among professionals. As the pain often starts in the mouth many people first go to their dentist and may have unnecessary dental treatment. A GP will probably only have a few people with trigeminal neuralgia in their practice and so are likely to be unfamiliar with the condition. People with trigeminal neuralgia should be referred to a specialist pain centre or a neurologist. Recognising trigeminal neuralgia is important as there are medications that can help to bring the condition under control. The drugs that are used to manage trigeminal neuralgia are anti-epileptics, especially carbamazepine or oxcarbazepine. These need to be prescribed by a doctor and started at a low dose, slowly increasing until pain relief is achieved. Unfortunately they have side effects which can be particularly troublesome in MS, including unsteadiness, double vision, tiredness and impaired cognitive function. With people with MS I will often use baclofen. A combination of higher doses with one of the other anti-epileptics can often help. None of the strong painkillers, including morphine, help trigeminal neuralgia. The medications do not cure the condition so it is a good idea to stop them when a remission period occurs. Surgery is another option but often less successful in people with MS. The nerve can be partially destroyed using heat, a toxic substance like glycerol or compression. This approach does have the risk of causing numbness but can provide a few years of pain relief and can be repeated. If there are no damage to the myelin on the trigeminal nerve and an MRI shows that the nerve is compressed by a blood vessel, then a microvascular decompression can be done. This will provide longer term pain relief but it is a major neurosurgical procedure. Living with the pain of trigeminal neuralgia can be draining but there are some options you can try to manage your trigeminal neuralgia yourself probably in combination with drug treatment. • avoiding particular foods if these are triggers for you. Caffeine, citrus fruits and bananas are amongst the possibilities. • If your pain interferes with, or is made worse by, biting or chewing, you may find that eating food of a softer consistency or liquidising food helps. If you are losing weight because of difficulties with eating, you may need to supplement or enrich your meals and you should ask your GP to refer you to a dietician. • Cleaning your teeth, washing or shaving can be more difficult so you may need to change how you do these daily tasks. • An occupational therapist may be able to assess the impact of your pain and provide suggestions and equipment to help. Dealing with trigeminal neuralgia can be very draining and lead to lack of sleep, isolation and depression. It is good to stay as positive as possible. Your MS nurse or GP may be able to refer you to a clinical psychologist for support in staying positive. This may include cognitive behavioural therapy (CBT) which encourages new ways of thinking and changes in behaviour. Seeing a psychologist or using psychological techniques doesn’t mean that the pain isn’t genuine and physical. These approaches can be just one of the ways that helps you deal with your pain and manage it well.